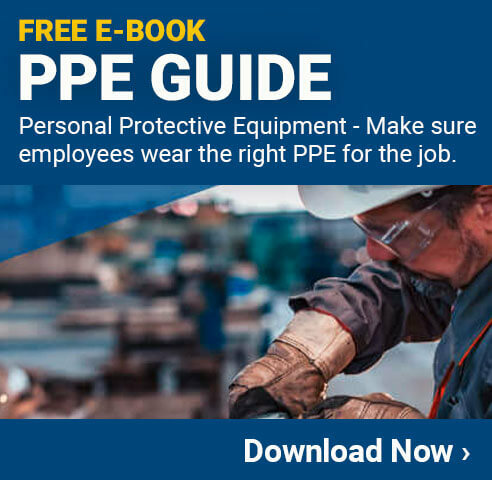 90% of on-the-job eye injuries could be avoided if workers wore eye protection. See a doctor or go to the emergency room as soon as possible if you can't get the particles out of your eye or if it still feels like there’s something in your eye after you've gotten the material out. See a doctor as soon as possible. If you can't get to an ophthalmologist right away, go to the emergency room. Don't use steaks or other food items. These can get bacteria into the eye. Don't take aspirin, ibuprofen or other non-steroidal, anti-inflammatory drugs. These drugs thin the blood and may increase bleeding. Eye safety works to reduce the number of eye-related accidents in the industrial field. According to OSHA, 1,000 eye injuries occur every day. This infographic explores the main causes of eye injuries in the workplace, how safety managers can reduce this kind of incidents, and how workers can protect themselves from harm. Stay safe. Let us help.